I have a little announcement to make. In October I bought the domain name www.grainelevators.ca, and it's now live. Grain elevator fans will remember this site was the site for Canadian grain elevator photos and information. Many 'vator fans had posted photos of grain elevators, old and new, and its forum was a gold mine of information. It was a fantastic resource. Over time it became hard to maintain and the owner, Chris Attrell, shut it down and redirected it to his new site, Anywhere.ca. I completely understand his reasoning but I missed the site. 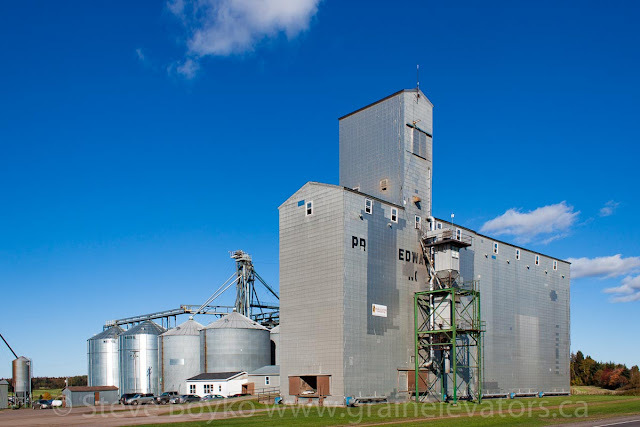 I founded my own grain elevator site, Manitoba Grain Elevators, to record the elevators I saw. 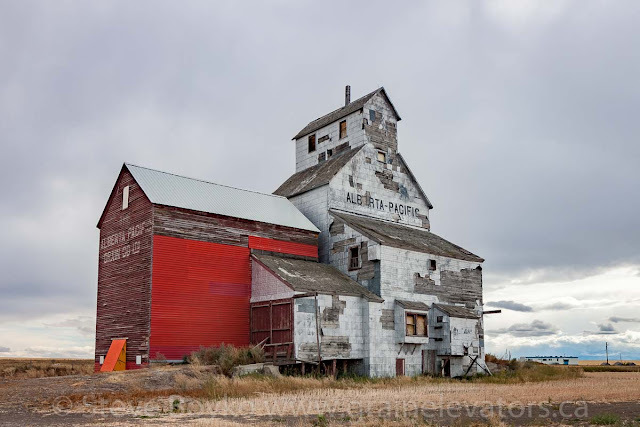 There are other Canadian grain elevator sites out there - Jim Pearson's Vanishing Alberta for example - but there wasn't any comprehensive Canadian grain elevator site any more. I decided that I wanted to revive the site, with the intent of publishing photos of every Canadian grain elevator that I and others had photographed. I knew I couldn't do it alone so I intended to reach out for help. I contacted Chris and I bought the domain name. I set up WordPress and started populating the site with my own photos. I started with Alberta and Saskatchewan elevators because I already had my Manitoba elevator photos online. Once I hit the end of my photos, I reached out in the Vanishing Sentinels Facebook group, and on Twitter, and several people have contacted me offering photos and assistance. I am very grateful for that. At this moment I am populating the site with Saskatchewan grain elevator photos from Adam Bouvier. I have a few other photos in the queue but I'm looking for more! Please email me at steve@traingeek.ca if you want to offer your photos to publish on the site. I want to ensure I have permission to post them so I only want photos from the original photographers... or public domain photos from before 1949. Traffic is starting to pick up, and Google has indexed 158 pages so far. Progress! This has been sucking up all my free time, so I haven't been writing here. I only have so much time for writing... but I'll be posting here in a few days about my recent visit to Kitchener, Ontario. I'll probably do a year-end roundup post as well. I have a lot of work ahead of me. There are literally hundreds of elevators yet to be documented. I have about 30 more elevators to post from Adam and a few more in the queue. I also intend to retire Manitoba Grain Elevators. There's no sense in having two grain elevator sites! I've moved a few elevators over to the new site and redirected the original page - for example, Elkhorn - but there are many left to move. This is pretty low on my priority list as those elevators are already online for reference. Please visit Grain Elevators of Canada and have a look around! P.S. speaking of grain elevators, did you know Eric Gagnon is writing a new book, on trains and grain elevators, two of my favourite things to photograph? It's nerdvana over here, I tell ya. Go follow his new blog to learn more, at https://trainsandgrains.blogspot.ca/.